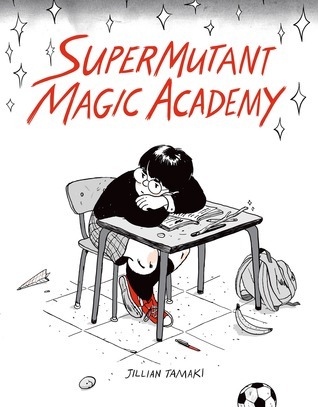 Review: Having read This One Summer and Skim, and absolutely loved both, I knew I had to read SuperMutant Magic Academy — even though I basically knew nothing about it. Summaries and explanations just don’t do it justice. Even by the time I had it in my hands, I still had no idea exactly what SuperMutant Magic Academy was about, or what to expect (other than awesomeness). My best attempt at an explanation is this — it’s a slice of life, sometimes four panel comic (and sometimes not) graphic novel set in, well, a supermutant magic academy…? There are witches and aliens and students with lizard heads and cat ears. This is all offered without explanation. What you get is a glimpse into their daily lives, with thin threads of plot and continuing relationships running throughout. The humor is at turns endearing and baffling — but in the best way. When I tried to get a friend to read it, all I could say was “Read it! It’s really weird! But good? Also, did I mention it’s super weird?” I ended up swallowing all 200+ pages of it in one go, and when I stood up afterwards, I just walked about in this haze of serenity and pleasant confusion. In other words… this is worth a read. Sit down with a cup of tea and just enjoy it from start to finish. Then we can talk about it, mostly through question marks and gushing praise.